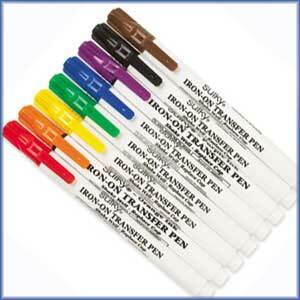 Home > Needle Felting Supplies > Iron-On Transfer Pens For Needle Felting! Many colors to choose from. One pen per order. Image shown for example only. An Iron-On Transfer Pen for Needle Felting that easily transfers designs permanently onto fabric, canvas, stabilizers, wood or just about any surface where a hot iron can be used. Perfect for all craft enthusiasts at all skill levels. Permanent - Non-bleeding - Ink glides on like a marker. Transfer 3-5 times with one application.